We’re a soccer crazy family. Let me modify that. 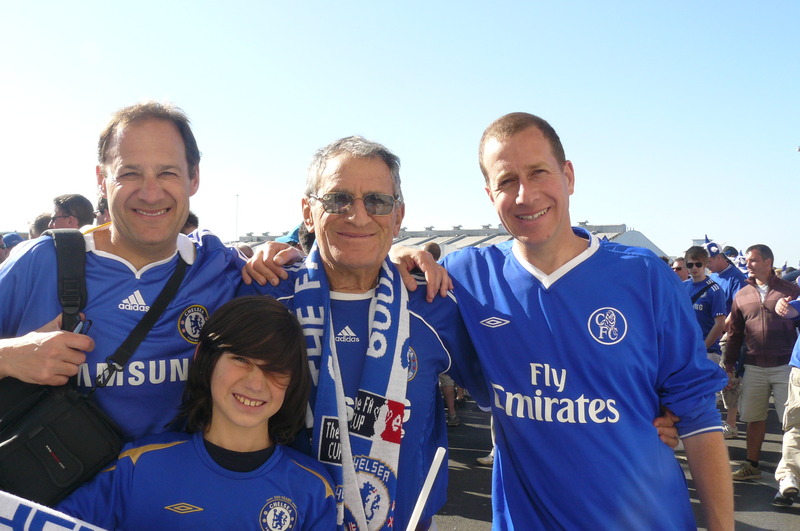 I am, I’ve been a fanatical Chelsea supporter since the dark days (for the club, not the world) of 1976, and I make no excuses for it. I didn’t plan it at all, it just turned out that way. My dad’s the same. We’re that half crazy (so I’m told) breed of supporter who has cheered on this team through all the crises of the 70′ and 80’s so the club is now firmly planted in our bones. 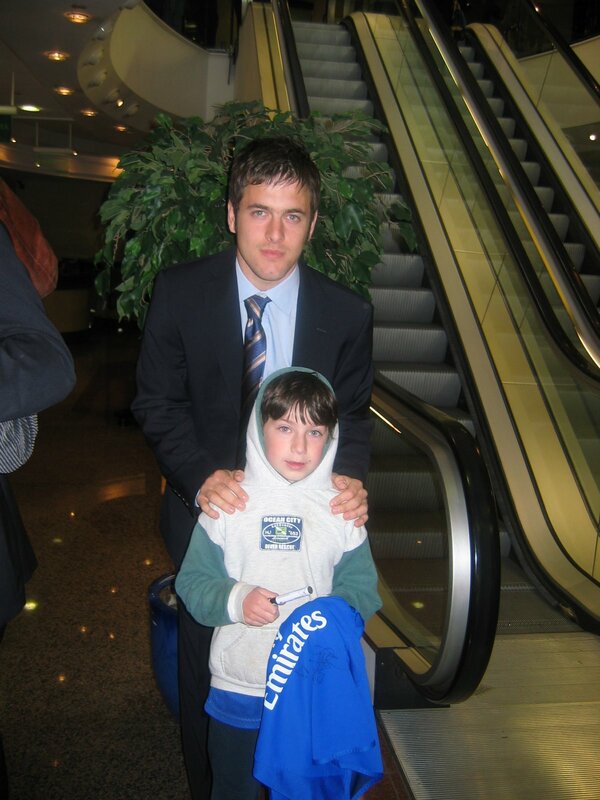 So how lucky am I that Benjy, who is now twelve, has pretty much been the same way since he was about three. Every weekend, early on a Saturday or Sunday morning, I wake him for the game, always checking that he brings his duvet with him, and we share this special time together. Not always joyful – a bad result means a bad mood for him (I’ve grown out of that at least), but somehow special nevertheless. 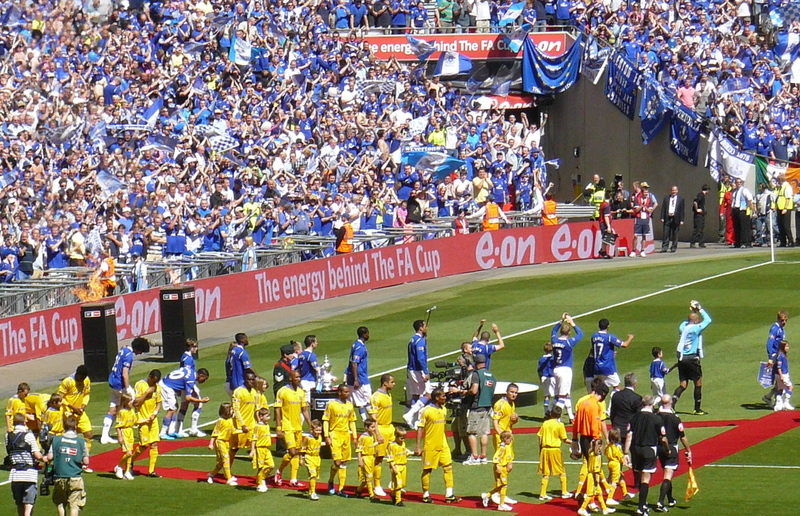 In May 2009, Chelsea reached the FA Cup Final at Wembley Stadium in London. I’m not even going to explain that if you don’t know what it is (Superbowl, World Series etc.) but there was a time I never dreamed of such a thing. You see, after Chelsea won the trophy in 1970, they pretty much went into the doldrums, and did nothing very good for a long time. My whole youth in fact. So when they did reach the final in 1994 (I’d only waited 18 years for that), the whole extended family trekked to London to watch an unfortunately horrible defeat, to the horrible Manchester United no less. 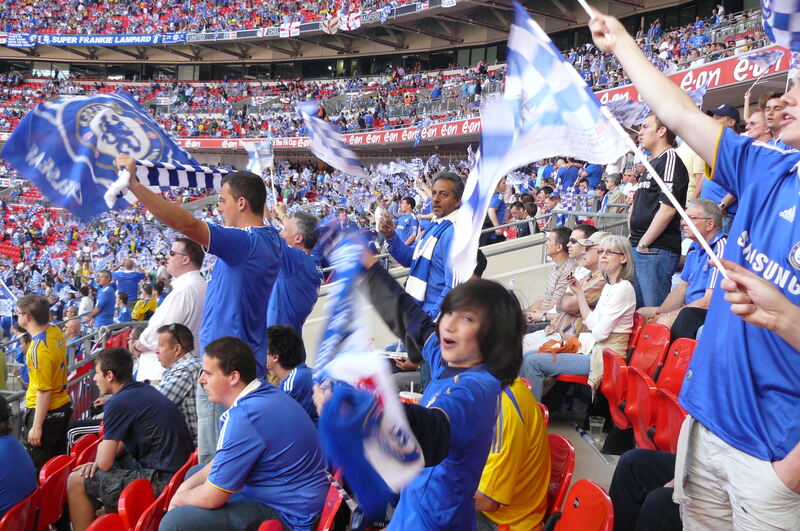 Then a great Chelsea team reached the final again in 1997, and off we went again, and this time we won (I can’t help talking in the ‘we’ person). Only some people appreciate what I mean when I say it was the best day of my life – what I mean is that it was the event I’d dreamed about most, so although my wedding day and the births of my kids were huge life celebrating and lifechanging events, how many boys dream of that ? Seriously ? We won again in 2000, lost in 2002, and when we won in 2007 it was the first time since 1994 that we hadn’t been there to watch. So last April, when we beat Arsenal – ugh Arsenal – in the semi final, it was clear we would go to the final. It would be me and B, and my dad. 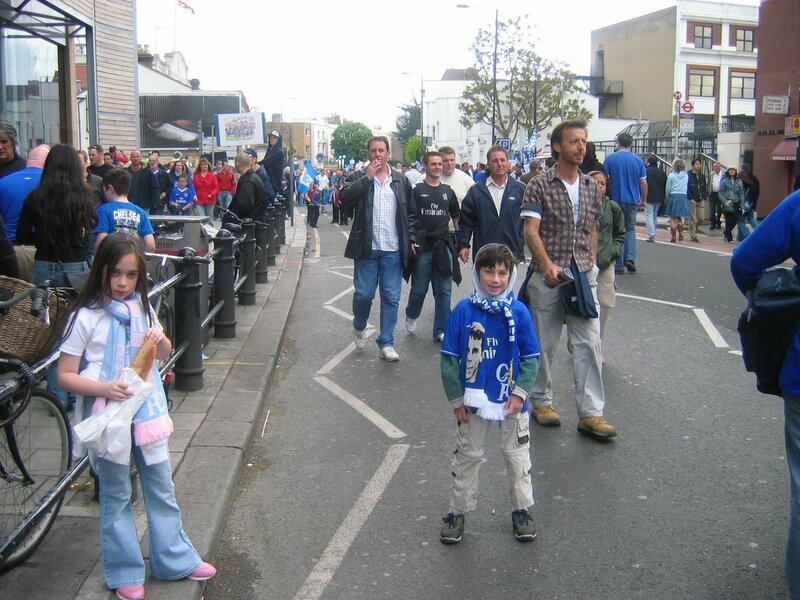 This wouldn’t be our first such trip – we went to London in 2005 to celebrate Chelsea winning the League title for the first time in my lifetime – but it would be the most emotional. And complicated . My dad became very sick in June 2008, and hadn’t traveled since then. 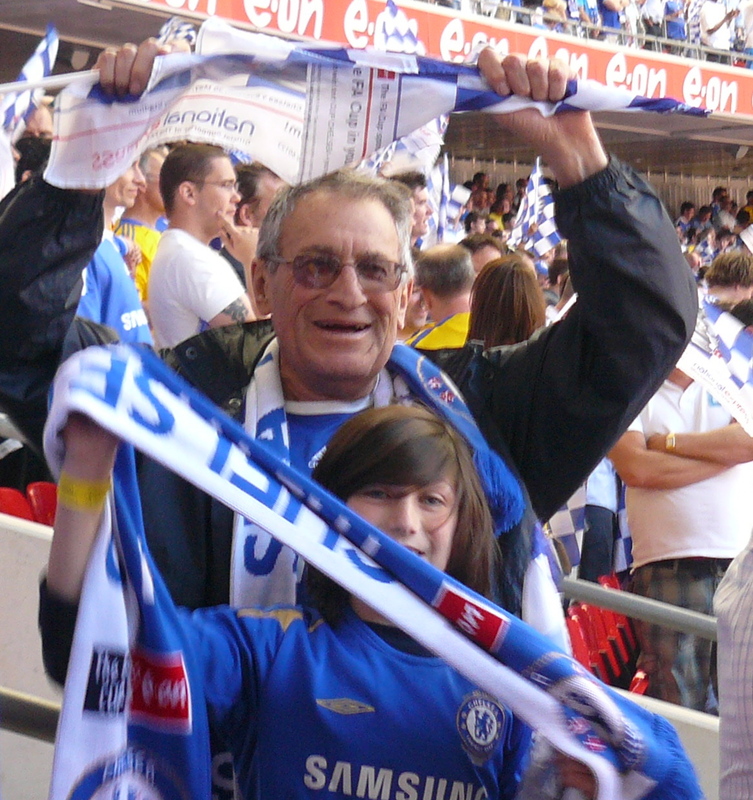 When he was at the depths of disease, I began to think how wonderful it would be if Chelsea could get to the FA Cup Final and we could all go ? It seemed a long shot at the time though. 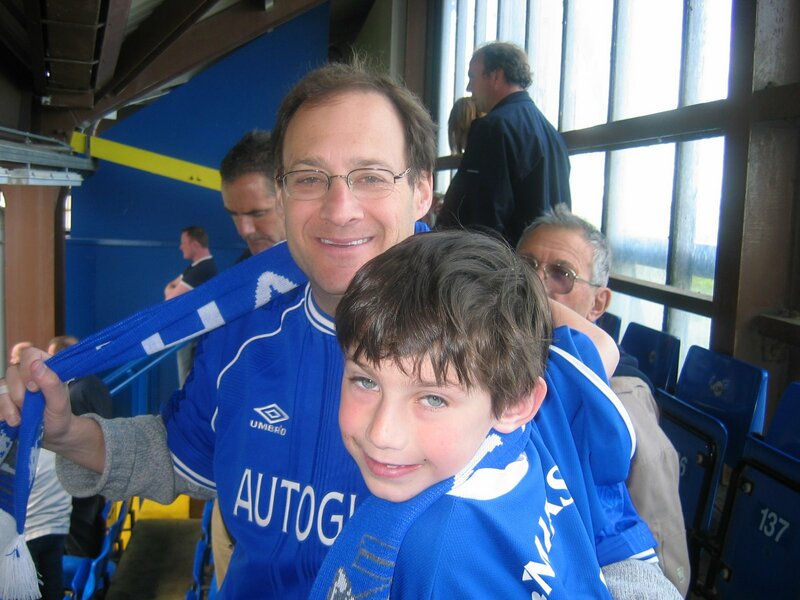 So although now the team had fulfilled it’s part of my deal, my dad didn’t feel he was up for such a trip. I was swept away by the emotion of it all – how could you not want to be there with your son and grandson ? – and eventually it was Benjy who swayed him. ‘ I want you to come with me, Paw. You have to come with us’. And so it was done. We’ll all meet at the hotel on Wednesday afternoon. After our long flight from Seattle, we’re exhausted, but have to kill a few hours before checking in to the Copthorne Tara Hotel. The hotel itself (with the financial crisis in full swing we get a great deal) is perfectly situated – it’s two minutes from the High Street Kensington tube station and everything you need is close by. 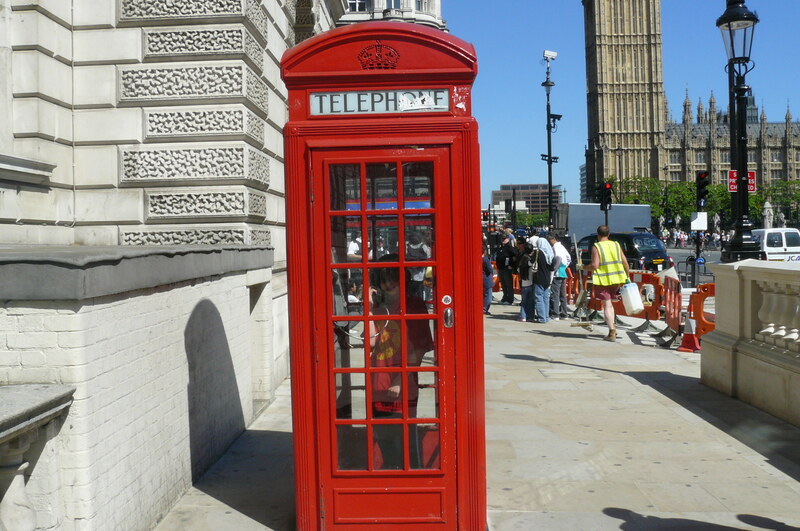 In addition to lots of shops and restaurants, KensingtonPalace and Gardens are five minutes away. In the past we’ve stayed at the Holiday Inn Gloucester Road which I felt was the best location in London : basically you get on the tube at Heathrow and without any changes, you get out at Gloucester Road and cross the street to the hotel. But this is better -the surrounding area is just so lovely and convenient, and central that you feel close to everything. Benjy has a chicken pie (he could live in London on chicken pies and salmon sandwiches) while I have coffee. We wander around, checking out the candy section at Tesco’s, and almost falling asleep in Waterstone’s Books before checking into the hotel. We meet up with my dad and brother (he’s flown in from Vancouver). We’re all too tired to go out, so we get more sandwiches from Tesco. Before that, we endure a nervewracking ticket exchange – somehow, in the excitement of getting tickets for the game, I’ve double bought (believe me, I can’t go into it here – it’s a long, complicated story). So we’re selling on Craigslist. If it falls through, I’m out of pocket $2,000. In the end it goes smoothly (there’s no profit involved, but no loss either) and we can relax. I fall asleep during the Champions League Final, but Benjy stays up through the game cheering on Barcelona as they beat the hated Manchester United. 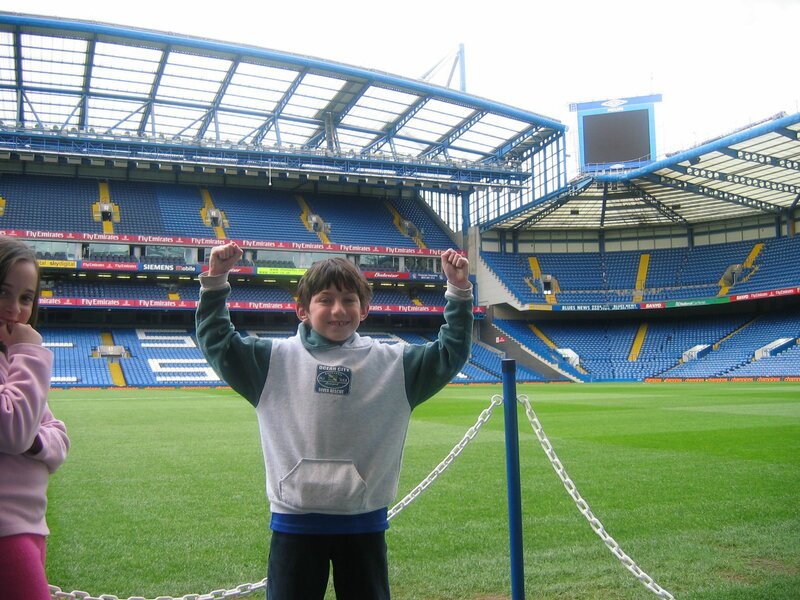 Next day we first make the pilgrimage to Stamford Bridge, home of Chelsea. We do the compulsory shopping and photo session. Mainly Benjy in a variety of different postures around the stadium. After that we go to Greenwich. I haven’t been since I was a kid so it feels a nice thing to do. We find a covered, local food market before going to the Naval Museum. 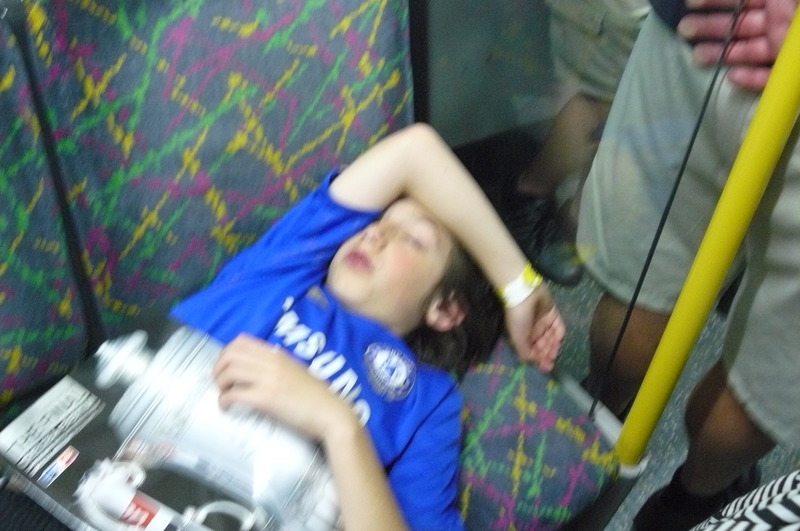 As soon as we get there, Benjy, who has been wide awake the whole trip, gets consumed by tiredness and jetlag. So we head back to the hotel for him to rest. That night we go to see Oliver !, one of Benjy’s favorites. It’s at the Drury Lane Theatre, a beautiful, old building. It’s also really hot. There’s no airconditioning (not allowed apparently in old, protected buildings) and we’re in the third last row, and it feels like all the hot air in the theatre has landed in my face. I also have no room for my legs (I’m a pretty average height) so it makes for quite an uncomfortable experience. In fact I can imagine being in Fagin’s underworld cavern. But the show is great, illuminated by Rowan Atkinson (Mr Bean) as Fagin. Afterwards we watch our fellow patrons, covered in sweat emerge – it looks like everyone’s just run a long distance race. We’re starving, so stop at Nando’s for a bite before going to bed. 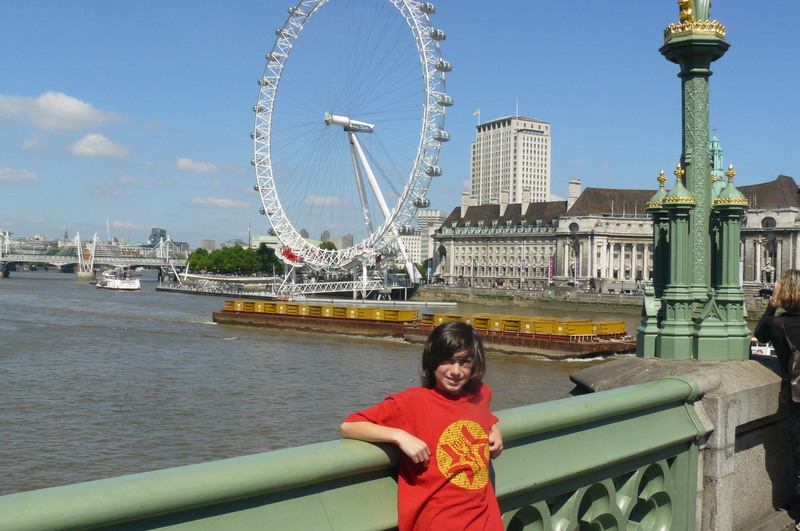 Friday I take Benjy on a bit of sightseeing. 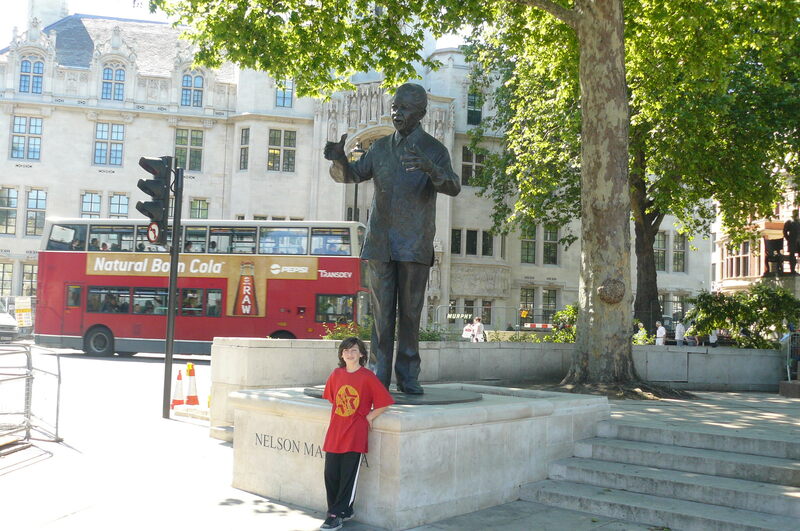 I’ve been to London more times than I can remember, but aalthough we’ve been as a family a few times, he was always very small. This is a great opportunity for us and we seize it with relish. It’s a magical, memorable day. One of those very special days that comes along too infrequently in life where we’re too often consumed by everyday nuisances like laundry, shopping, homework and fixing dinner. this is pure enjoyment, the weather’s great, we’re totally relaxed and it’s a father son day to be treasured. As the soccer is the next day, we have the whole of Friday to enjoy ourselves and forget how nervous we’ll be in just 24 hours. 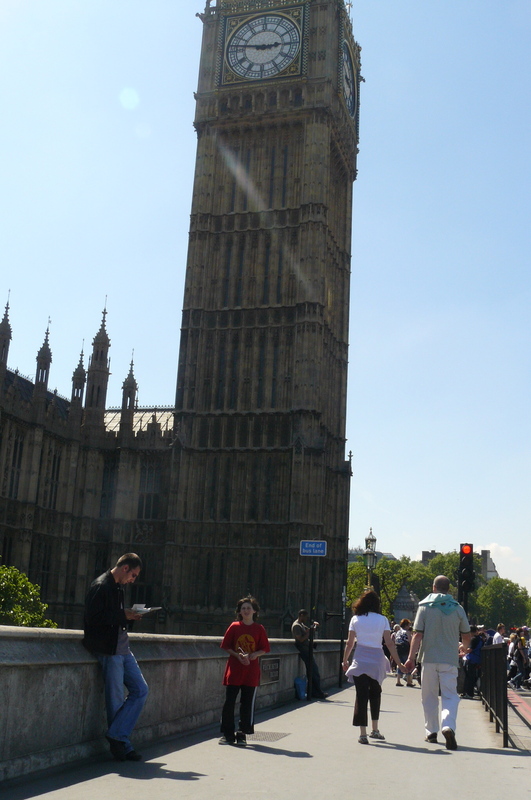 After walking around a lot, we end up at Big Ben and Westminster. 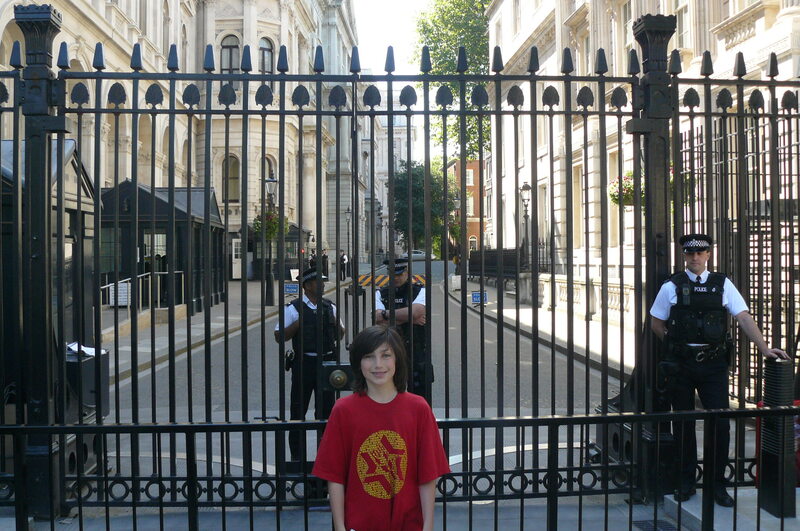 We stroll past Downing Street and on to Covent Gardens. Eventually we give in to our tired legs and go back to the hotel. It’s been a wonderful day and I hope I remember every detail for a long, long time. Saturday we’re up early. We both can’t really sleep, as we’re so excited and nervous. I go for a run in beautiful Kensington Gardens, and by 11 we’re off to Wembley. We very early and can’t really hang out in a pub with everyone else, so we have fish and chips. At some point we go into the stadium. I’m totally overcome with emotion and the sense of how big this is in my family. Will we ever get the chance to do such a thing again ? Mostly I’m thinking of my son and my dad, and feel so happy and privileged that we’ve been able to do this. The game itself takes forever and is over in a flash. We have terrific seats, low down, just behind the goals. When the teams come out, I’m completely overcome by emotion. I probably would be if I was there alone as I think back to all those years of failure when I never thought I’d get to see my team on this stage. 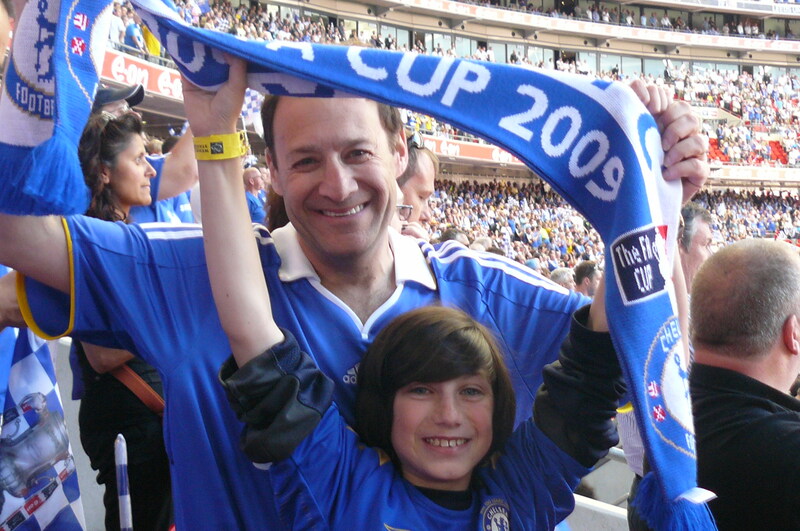 Here, at my 5th FA Cup Final, that emotion is multiplied by the 1000’s as I look over to my son taking it all in, and my dad and all that’s happened in the last , awful year. And then, right in front of us, Everton, our opponents , score after 24 seconds. The fastest goal in Cup Final history, going back well over 100 years. We’re stunned. 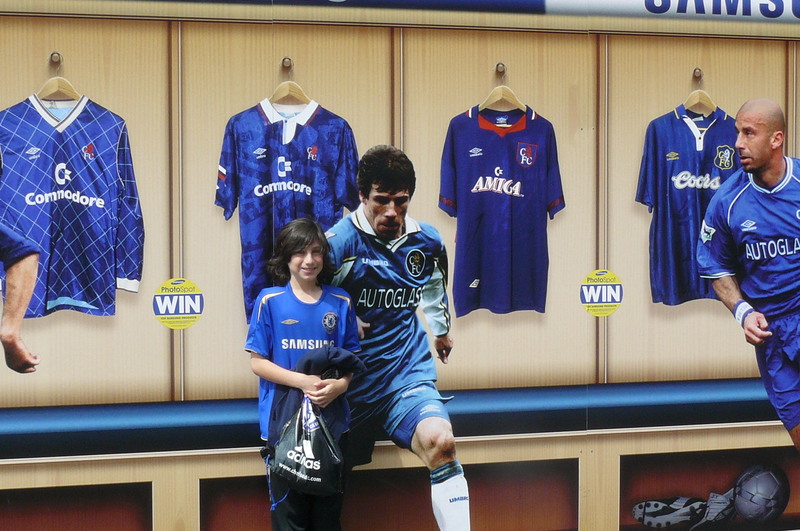 It seems completely wrong – surely God understands we have to win ? B looks like he’s going to start crying. I don’t know if I feel worse for him, my dad, me or my master plan but the team gets going and when we equalize it’s pure relief. The second half is all ours and we have several scoring opportunities. 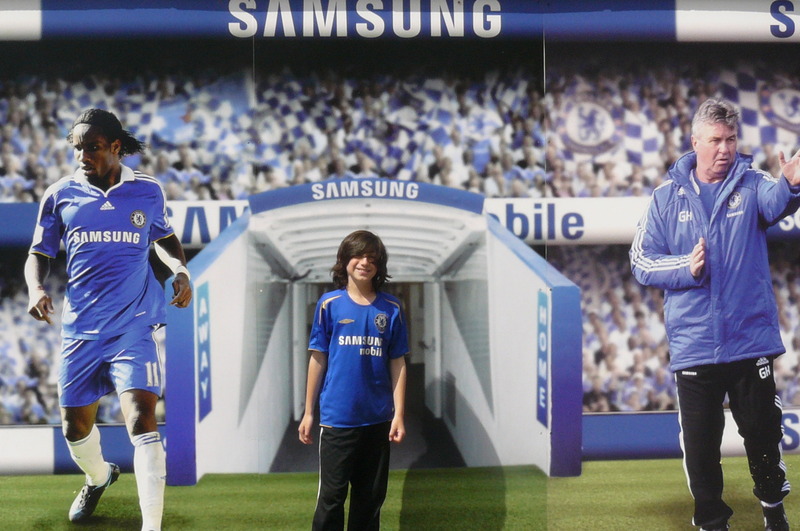 With 18 minutes to go, Benjy’s favorite player, Frank Lampard, scores what will be the winner. Right in front of us. We’re so ecstatic I can’t breath properly. Everyone around us, complete strangers, are hugging us and screaming and it’s total bedlam in the best way possible. We count down the minutes and then utter jubilation. Only someone who takes their sport, their team so seriously and so passionately can appreciate the sheer joy of the moment, one of those that lives in your mind forever. Outside it’s joy unconfined. It makes those cold Saturday mornings, the negotiations over tickets, any familiy politics, all of that worth it. There’s nothing quite like this feeling of joy. My brother still makes us get Georgian take out food for dinner (not B, he gets a sandwich) – we think it’s awful, but we don’t care. Then our flight gets rerouted and delayed. We still don’t care. This has just been a perfect trip, and whenwe get home we feel like we’re the victors bringing the cup back .